We actively seek out people that need Gods assistance, in our parishes, work places, neighborhoods, among our friends, in our families, and bring those intentions to God in daily prayer. Collect food and money, for Food for Friends , to feed the hungry. Actively publicly protest against the killing of our unborn brothers and sisters through the practice of abortion. We offer assistance to the women, and guide them to the resources to keep them and their unborn children alive and healthy. 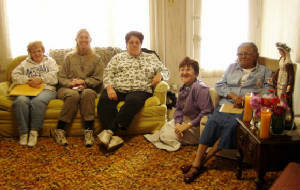 We support Tau House, a Secular Franciscan Retreat House and Hermitage, that is the place of gathering for many of our communal days of recollection and retreat weekends. Nestled in the mountains of Schuylkill County, PA in the little town of Tamaqua. We serve as Eucharistic Ministers, ushers, greeters, and council members in our home parishes. The Consolation of Christ Fraternity, Secular Franciscan Order.